E.1027: So who is this Jean Badovici guy anyway? Case study of E.1027 by Eileen Gray for Don McKay's ARCH100 course in UWSA, by Mark Cooper, Claire Ludewigs, Maddi Slaney, and Emmeily Zhang. All posts edited by all members. So who is this Jean Badovici guy anyway? There is much speculation about the involvement of Jean Badovici in the design and construction of E-1027. The 10 and the 2 in the name of the house are code for his initials, but it's unclear if his role extended beyond that of influence and advice to Eileen Gray. A brief investigation after the break. Jean Badoviso was born in Bucharest in 1893 and studied architecture at L'Ecole des Beaux Arts and at L'Ecole Speciale d'Architecture in Paris from 1917 until 1919. In 1921, he met Eileen Gray, who was in the process of opening her gallery at Jean Desert. He was 28 and she was 43 at the time. The story goes that they became lovers. In 1923, he became the editor of an architectural publication that would grow to be one of the most influential in Europe, titled Architecture Vivante. It is said that he was the one that persuaded the powerful publisher Albert Morancé to give the journal it's start. Architecture Vivante became the mouth piece for some of the most important characters in the modern movement. The magazine frequently published and reproduced works by the members of the De Stijl movement, as well as those from the Bauhaus, particularly Walter Gropius. Le Corbusier, Frank Lloyd Wright, Mies Van der Rohe, Bruno Taut, and Adolf Loos all contributed to the magazine throughout it's lifetime. Through this position, Jean Badovici became friends with a lot of important figures, including Corbusier, who grew to be quite close with both Jean and Eileen. In 1924, Badovici helped to write an issue of the Dutch magazine,Wendingen, devoted entirely to Eileen Gray. Badovici helped Gray develop as an architect in training through series of home renovations in Vézelay, as well as a few theoretical architecture projects such as the House for an Engineer and the rethinking of one of Adolf Loos' houses.What is evident, then, is that when it came time to collaborate with Gray on E-1027, that he had an interest in realizing a lot of the architectural principles and objectives that were published in his articles. The influence from the leading architects featured in Architecture Vivante in the design of E-1027 are obvious. The house incorporates all of Corbusier's "Five points towards a new Architecture", the spiral staircase that runs from the ground to the roof is inspired by Tatlin's Monument to the Third Internationale, and a lot of Eileen's furniture is inspired by the Bauhaus and DeStijl movements. Architecture Vivante was one of Gray's most important textbooks, and Badovici seems to have been her greatest mentor. So how much of the design of E-1027 was Badovici responsible for? According to Peter Adams, he visited the construction site only on occasion, making sure that the technical matters were being tended to properly. Caroline Constant, on the other hand, suggests that he was much more involved. She notes that because of his deep involvement in architectural discourse at the time, that he felt responsible for implementing the avant garde objectives that Architecture Vivante was known for. It seems from a lot of Eileen's comments suggest that she was opposed to the dehumanizing nature of the international style, so according to Constant, it may make sense that it was Badovici who insisted such strict adherence to Corbusian principles. Badovici also owns the patents for the innovative sliding windows in the home, suggesting that the may be responsible for their design as well. While his exact role remains unknown, we do know that he and Eileen lived in E-1027 after it was completed. In 1929, Architecture Vivante published a special issue devoted entirely to E1027, in which he gives a medium for Eileen to talk about her architectural objectives in the design through a back and forth dialogue between the two. Eileen designed another house for herself in 1932, and moved there, while Badovici kept the home as a vacation spot, and built another home for himself in 1938. When Corbusier painted his infamous murals throughout the house between 1937 and 1939, it was Badovici who encouraged him to paint them. Despite Eileen's outrage, Badovici sent a letter to Corbusier saying, "Your frescoes more luminous and beautiful then ever. Intact. 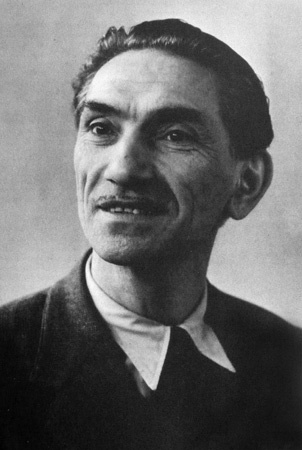 The contented always have little need to express their joy too vocally .... "
The house remained in Badovici's possession until his death in 1956. Despite their differences, Eileen and Badovici were partners. Their lives were as intertwined for some time as the code E1027 implies. He was undoubtedly Eileen Gray's biggest mentor in her architectural development, and an important figure in architectural discourse in the early half of the 20th century. 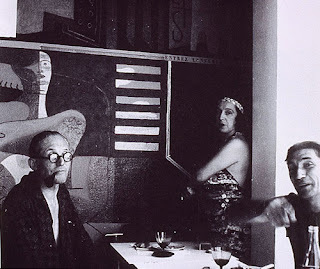 Badovici, Corbusier, and his wife. Posted by Mark C. at 11:00 a.m.
MAKKI BABU 9/27/2017 3:59 a.m.